Note: These two programs are the introductory courses you need to take as your first step toward becoming a YFS Certified Instructor! Email us for info on new dates for live training. Isn't it time for you to take the plunge? Come spend a bliss-filled week with us in San Clemente this coming September to hone your yoga+ surf skills and learn how to launch your new career in teaching yoga! Prior to that (and at your convenience) you'll be able to do the online portion of the teacher training (with my personal help and guidance) so more of our time together can be put to practical application of your new skills. Without ever stepping foot inside a yoga studio -- and even if you're on a shoestring budget! Enter your name and email to gain instant access to Peggy's comprehensive strategy video! Imagine yourself with us on an adventure of a lifetime with like-minded surf-stoked yogis (all levels, even beginners, welcomed!) enjoying the authentic local experience of the surf capital of Southern California! You don't need to be an expert surfer or experienced yoga student to attend the YOGA FOR SURFERS® Teacher Training Program in Southern California. You just need to get ready to launch yourself on this exciting, life-transforming opportunity and let your spirit soar! YOGA FOR SURFERS® Teacher Training isn't just a training program -- it's a transformation program. Melinda Ferreira also starred in Peggy's baby on Board Pre-natal Yoga DVD! You get complete teaching sequences to start using immediately...and lots of practice to feel super confident! This program is worth every single penny! Get your yoga teacher training certificate from the ONLY program in the world that specializes in teaching surf-specific yoga! Peggy Hall is the pioneer and innovator of YOGA FOR SURFERS®, so you learn directly from the creator! Gain confidence and experience when you join the YOGA FOR SURFERS® Teacher Training program and discover the power to live your dreams! viti gonzalez in her element! Don't worry -- you don't need to be an expert surfer or experienced yogi to apply! Your age, background or yoga/surfing experience is not important. What is important is your passion and enthusiasm! If you love the ocean, love yoga and want to put your passions together -- then this is the exact right training for you! What is the YOGA for SURFERS® Teacher Training Program? The YOGA for SURFERS® Teacher Training is the only program in the world that specializes in preparing you to teach yoga to surfers. You learn directly from Peggy Hall, the creator of the world's first-ever (and best-selling) YOGA for SURFERS® DVD series, with more than 125,000 copies sold around the world! You get all of Peggy's secrets and strategies for making money doing what you love, anywhere in the world. When you attend the YOGA for SURFERS® Teacher Training, you discover the power to live your dreams! Living the life of your dreams -- on your terms, on your time -- anywhere in the world! All of this is possible, and more -- even if you are currently not an expert in surfing or yoga. 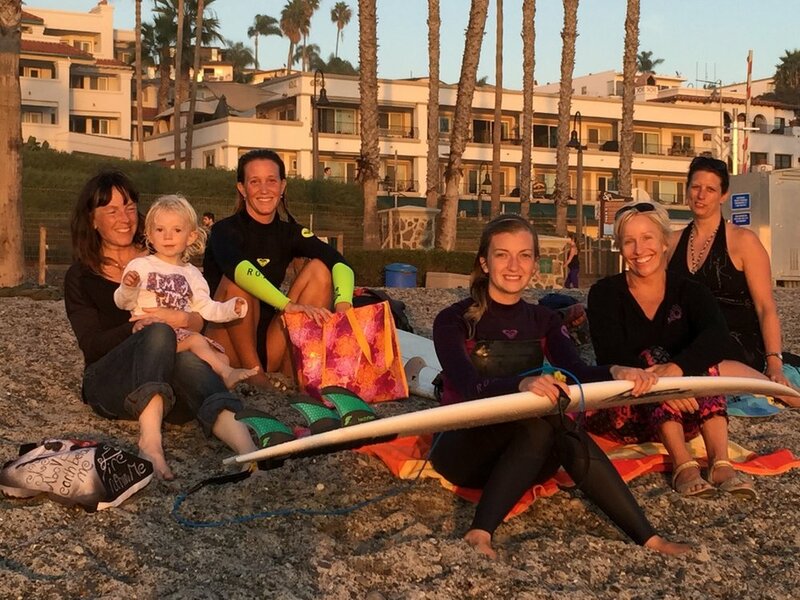 The YOGA for SURFERS® Teacher Training is perfect for you if you want to improve your yoga and surfing -- while enjoying the authentic, local life in the surfing capital of Southern California! When you join the Yoga for Surfers® Teacher Training, you'll discover that you no longer have to live your life according to someone else's rules, requirements or restrictions. You'll learn how to teach Peggy's Yoga for Surfers® style -- and, how to create a profitable surf/yoga lifestyle business, anywhere in the world! As the pioneer of the surf/yoga movement (starting back in 2002) Peggy was the first person to put yoga + surfing together and it has now exploded and expanded all across the globe. You have the exclusive opportunity to learn from her directly -- as she shares secrets to success, developed over more than a decade. After receiving your YOGA for SURFERS® Teaching Certificate, you will be on your way to a new freedom-filled lifestyle, one that contributes to the happiness of others as well! WHO is the YOGA for SURFERS® Teacher Training For? YOGA for SURFERS® teacher trainees come from all walks of life. We welcome a variety of ages, backgrounds, experience, surfing/yoga ability, etc. The youngest participant we've had was 18. The oldest (who's counting?) we've had so far was 68. Please, don't sit on the sidelines and watch others do what you are called to do. This is your LIFE -- live it the way you really want to! Why settle for a life of "what if's" and "if only's"? You only have one precious life -- now is the time to make the most of it! Can you relate to any of these reasons our past teacher trainees have stated? 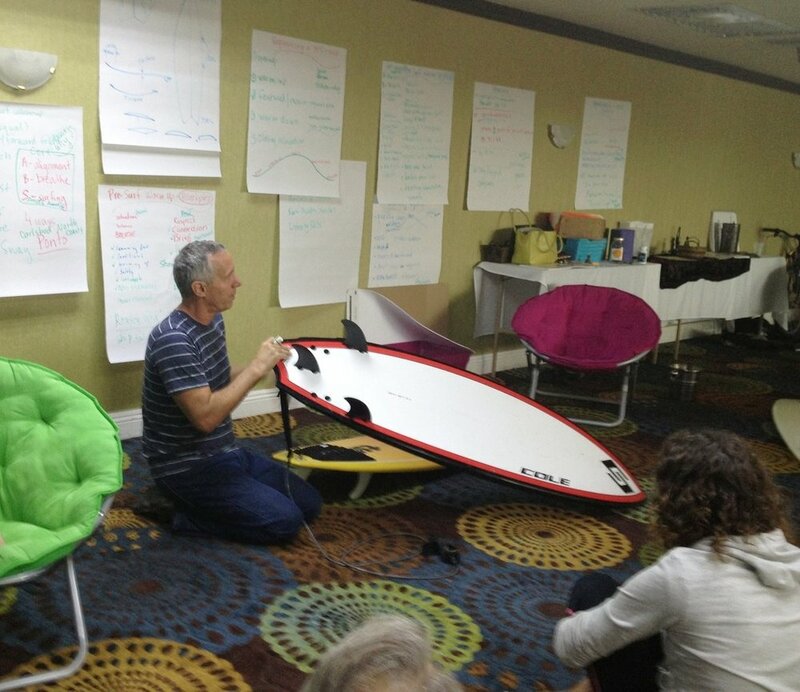 There is no one "right" reason for wanting to take the YOGA FOR SURFERS® Teacher Training. The "right" reason is the reason why YOU want to participate! Whatever your own reason for attending the YOGA FOR SURFERS® Teacher Training Program is, be sure to take action right away so you don't miss out. Launch yourself on the wave of your dreams! The minute I walked in the door and saw Peggy, I felt her light and energy. I knew 100% with my whole heart I was in the right place at the right time! The course had the biggest possible influence ever on my life, my yoga and my surfing. I feel stronger, more confident and so full of knowledge. Josh, Peggy and Nikki sharing the YFS stoke! Every morning we go to a different beach for a yoga class right on the sand! You'll experience Peggy's pure, positive energy and inspiring instruction as she leads you through a different class each day. You'll learn poses for pre-surf warm-up, post-surf recovery, healing, conditioning, meditation, breathing exercises, etc. Following the morning yoga class, we'll get in the water and surf, applying the YOGA for SURFERS® principles to "breathe, relax, focus and enjoy" every single moment on the waves! enjoy a morning yoga class led by peggy right on the beach before surfing! You start doing practice teaching right away, right on the beach! Plenty of surfboards for you to borrow! We also drive you to and from the surf locations! So you can relax and have fun! Feeling great after a morning session of yoga + surfing at Famous, perfect and beautiful Salt Creek! nothing like sharing the pure stoke of surfing! Everybody surfs better after doing a yoga warm-up! AFTERNOONS : Lunch, Surf Clinic, Discussions, Practice Teaching "Yoga Secrets"
We enjoy lunch together, with more personal interaction and sharing -- diving into engaging discussions of the Yoga for Surfers® philosophy, lifestyle, yoga anatomy, philosophy, energy movement, healing, business development, etc. After lunch you’ll review the morning's yoga class with Peggy as she breaks down the poses, sharing her “Yoga Secrets” with her unique variations of poses – many you have probably never experienced before. We enjoy most of our meals together, especially lunch after a morning of surfing + yoga! you'll feel like a local eating at all the friendly and healthy local cafes and restaurants -- so good after surfing! Next comes what most trainees say is one of the highlights of the program: practice teaching! Don’t worry – it’s one pose at a time, one person at a time, and then over the two weeks you build from there. you learn surf-specific poses that you won't find anywhere else! Past trainees say this is the most valuable part of their experience, as they leave feeling confident and competent to design and teach a fun, effective, inspiring class that matters. Much of the activities are done in pairs or small groups so you are always involved and participating. This is not a boring lecture format, but is interactive and engaging! You'll have interesting homework assignments to practice what you've learned and gain more knowledge and experience. After a full day of yoga, learning, teaching, exploring, sharing – why not catch a sunset at the San Clemente Pier? Or, enjoy another surf session? We share our evening meals together and enjoy talking about the adventures and discoveries we made that day. You’ll want to get a good night’s sleep so you’ll be refreshed, energized and ready to go the following day. This is not the time to skimp on sleep or nutrition, as you want to have your physical energy and mental focus at their peak during the YFS-TT. yes, there's even time for a beer and hamburger on the san clemente pier after a day of surfing + yoga! often we'll go for a sunset surf to end the gorgeous day! There was such a feeling of strong positive energy that was beaming out of each and every one of us! With each day, I felt a huge sense of gratitude and enjoyment for life. Surfers of all levels are encouraged to attend! You get expert surf coaching to help you catch more waves and surf them better longer. Don't worry about bringing your own surfboard -- we'll have plenty of boards for you to choose from! And if you haven't been in the water for a while, don't sweat it -- David Hall is an expert surf instructor and you get plenty of tips to boost your performance. 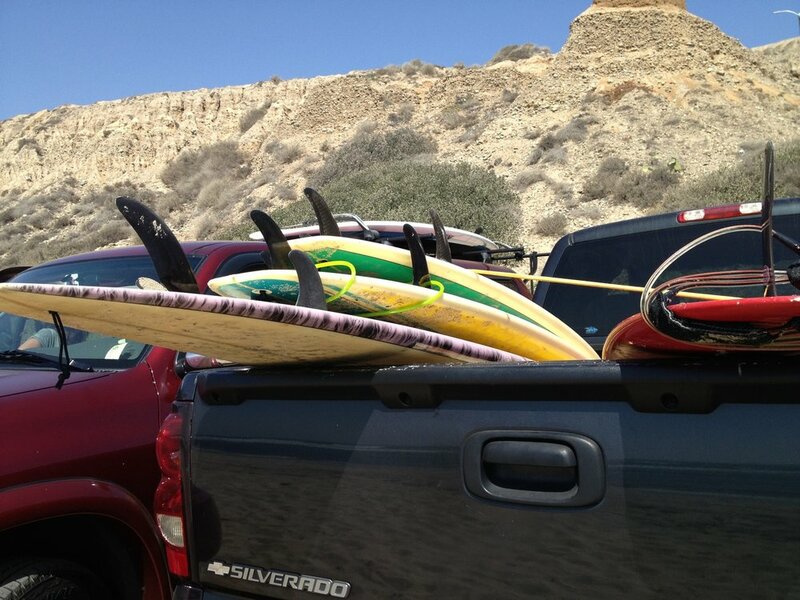 Getting ready to paddle out at Salt Creek. Enjoying the afterglow of a great surf session at the iconic SanO's. You can also try body surfing, boogie boarding, stand-up paddle -- or if you prefer, take a walk or a nap on the beach. Many trainees have caught the surfing bug and are stoked to be in the warm waters of Southern California, ready to drop any limitations and soar! We will help you do just that. You'll visit the most iconic surf spots in all of Southern California including San Onofre (SanO's), Trestles (Lowers and Middles) and Salt Creek. We'll show you our favorite local spots that most tourists don't know about. If you love to meet like-minded people who are passionate about yoga + surfing + healthy living; if you are able to open your mind, body and heart to a new way of learning and teaching, if you are ready drop any limitations and soar – then this program is for you! Trainees are from all backgrounds, ages and different levels in both yoga and surfing. The YFS-TT is especially geared toward those who want to be entrepreneurial in sharing their yoga outside of the traditional studio setting. You are not required to be an advanced yoga practitioner (or expert surfer). In fact, the YFS TT is perfect for those who are relatively new to yoga, without advanced yoga training. Peggy's approach and philosophy is rather unconventional -- there is no chanting and very little Sansrkit, for example. But you'll find that this unique approach and philosophy is what makes Yoga for Surfers® so appealing and accessible to a wide-range of students -- and trainees. YFS TT graduates have gone on to creating their own yoga/surf retreats, create wellness/yoga centers; coach others privately; lead tours and workshops in related fields like stand-up paddle, rock-climbing, corporate yoga and the like. Only a handful of trainees are accepted each year. This is not a "diploma mill" where you will be an anonymous person in a huge group. Instead, you will get personalized attention from Peggy and get to know, interact, share with and learn from the other trainees. To take your place among the select few, apply early. Please don’t delay – the course sells out every year. Don’t worry -- you don't have to be an expert surfer or have practiced yoga for years in order to attend the YFS-TT. Your age or gender is not important. We welcome trainees from all backgrounds and levels. What is more important than your experience is your attitude and outlook. That’s because successful graduates become Global Ambassadors for Yoga for Surfers® – and we select those who can embody and embrace the unique YFS philosophy, outlook and attitude. WHERE exactly is the training held? We meet every morning in the YFS Training Room at the Holiday Inn in downtown San Clemente. Many of the classroom discussions, pose breakdowns, business secrets, yoga classes, etc. will take place there. Weather and conditions permitting, we do get to the beach for yoga and surfing on a daily basis. It's important to have the hands-on experience of teaching outside on the sand, because it is quite different than teaching inside at a yoga studio. You will learn all of Peggy's secrets for overcoming the challenges of teaching in unusual places, settings and situations. What about accommodations and meals? 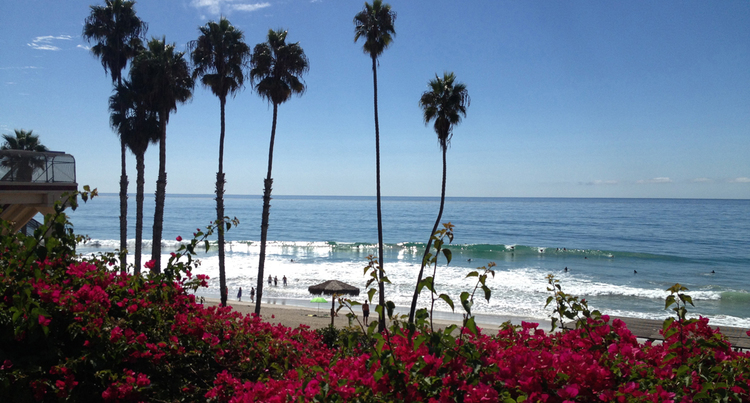 Your accommodations and meals are all included in the 6-Day Yoga for Surfers Retreat in San Clemente. We often will share meals picnic-style and also eat together for lunch and dinner to talk more about yoga + surfing! Will I be CERTIFIED to teach? Yes! Trainees who successfully complete the program will be certified by Peggy Hall as a Yoga for Surfers® Certified Instructor and are eligible to begin teaching right away. Many Yoga for Surfers® Instructors go into business for themselves – setting up workshops, retreats, teaching in their own home-based studio or on the beach! The opportunities are endless, and you’ll learn exactly how to get started as a well-paid Yoga for Surfers® Certified Instructor, with Peggy's "Business of Yoga" secrets. Graduates of the YFS-TT are eligible to join the International Yoga Registry, which is a division of Yoga Alliance International and the International Yoga Federation, the largest yoga organization in the world. Yoga for Surfers® Certified Instructors are qualified to apply for an International Yoga Teacher Card recognizing 100 hours of study. For most of the participants, doing the YFS teacher training has its own reward: you get into yoga so much more deeply than if you just practiced on your own, even if you decide not to teach. This course has taken out all of the complications and mystery surrounding yoga teaching — it’s SIMPLE! I loved learning the pose breakdowns and all of Peggy’s yoga secrets. I took what I learned and opened my own yoga studio — Soul Coast Yoga — in Western Australia! How is this program DIFFERENT from other yoga teacher training programs? The YFS-TT is the only training program in the world that trains you to teach surf-specific yoga. What you learn can be applied to other groups as well – YFS-TT grads have gone on to teach yoga to mountain climbers, skiers, SUP surfers, seniors, kids, competitive surfers, office workers – and everything in between. That’s because what you learn in the YFS-TT is not how to memorize a set series of poses – instead, you learn to develop confidence and competence in creating a safe, effective, fun and inspiring class that caters to the exact need of your target market. You'll also learn how to create a successful living with your yoga skills. Most teacher training programs just talk about how to get a job at a yoga studio – we go way, way beyond that and show you how to create a lifestyle/business outside of the typical studio setting. Many participants say that Peggy's "Business of Yoga" component is one the most valuable parts of the training. This is the ONLY program in the world that specializes in preparing teachers to teach yoga to surfers. The group size is limited to fewer than 16 trainees, so you receive individual attention and instruction. Peggy teaches every session of the entire program. You learn from Peggy directly. You start teaching on the very first day. Don’t worry – it’s fun, friendly and comfortable! You start one-on-one with just one pose, and before you know it, you’re planning and teaching complete classes with confidence and enthusiasm. You learn Peggy’s "Business of Yoga" strategies and get access to her secrets to being a well-paid yoga instructor. You’ll learn unique, unconventional and nontraditional ways of making a profitable living with your surf/yoga lifestyle. Many YFS-TT graduates said this part of the program alone was worth the price of the training. Perhaps best of all, you create deep and lasting friendships with like-minded surf-stoked yogis from around the globe! Many trainees visit their new friends in countries around the world. Some trainees have attended two -- even three times! There is always something new to learn and share. Investing in yourself by learning and personal development is an investment you can never lose. Click to listen to the YFS-TT preview training call where Courtney is interviewed about her experience as a participant in the program. A simple, 5-step system for creating a unique, fun YFS class sequence no matter the level of students or length of class. It's like "plug-and-play" -- you can't fail! The Business of Yoga -- Peggy's secrets for success! You'll leave the YFS-TT with complete lesson plans and business action steps, including a unique, memorable name for your business, at least three ideas for workshops, and several ideas on how to get paying clients right away. No more wondering how to get started and what to do first. 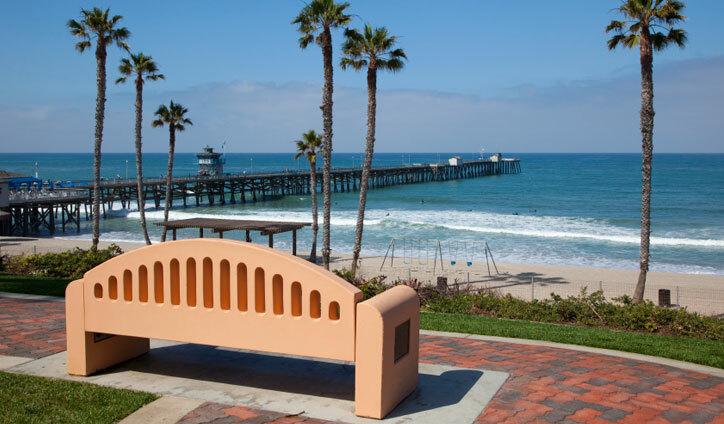 San clemente pier is a 15 minute walk from the volare hotel, headquarters of yoga for surfers teacher training! Click here to listen to Melinda share her amazing experience as a YFS-TT trainee. What if I have an INJURY or physical limitation? Don’t worry – many of your students will be the same way! We have had trainees who were recovering from all sorts of injuries and conditions – and in each training, we have had ladies who were pregnant! That’s part of the beauty of Yoga for Surfers® – you’ll earn that it truly is “one size fits all” – it fits your size, your needs…and those of your students as well. When you personally have experienced an injury or limitation, it makes you MORE aware and understanding – and a better teacher because of it. What if I can’t do all the POSES in the YFS DVDs? That is actually not important. That’s because Yoga for Surfers® is not about executing a perfect pose – it’s about experiencing yourself in the pose – aware, relaxed, focused, calm and free. Being able to explain the pose and teach in a way that is safe and effective is what is important. How much YOGA experience do I need? All levels are welcomed. The YFS-TT is actually ideal for those who do not have any experience teaching yoga -- because you will get started with an excellent foundation and benefit from Peggy's gift of teaching teachers how to teach. Your outlook, attitude and willingness to learn are much more important to me than your years of yoga. What if I haven’t SURFED in a long time? This is perfect for you because you'll get expert surf coaching, daily surf clinics with tips about board selection, how to read the wave, catching waves, turning, kicking out, paddling, safety, etc. You also get free use of a variety of surf boards. Trainees have ranged from avid surfers who could not miss a day in the water to those who had not been on a surfboard in years. Surfing is not required to attend this program, but a thirst for the yoga for Surfers® lifestyle and philosophy is. Some trainees are content to walk on the beach while others get in the water on body boards, SUP, surfboard, swimming or just napping on the beach. We also have great surf instruction available at no extra charge. Because the training is limited to a small, exclusive group of hand-selected trainees, we regretfully are unable to offer any scholarships or work/study programs at this time. However, we do offer a payment plan that makes the tuition payments easier on the pocketbook. Otherwise, you can benefit from Peggy's free yoga teacher training tips that she makes available as her offering to those who are unable to attend. Are you willing to settle for a life of “what if’s”? Let your dreams pass you by? Are you willing to watch as other people live what you have been called to do? Or are you willing to stop circling the water’s edge and instead – dive in, drop any limitations and soar? I know it can be a little scary to invest this amount of time, money and energy -- to travel a great distance and to make significant changes in your life. That is perfectly normal. But I've found that when I truly listen to my inner voice, my true self shines through and always guides me to my higher good. That is one of the greatest gifts I've gotten from yoga. Can't wait to share it with YOU! So I encourage you to trust yourself -- and trust life! Remember, you have the power to live your dreams! This is YOUR life and you should live it the way you want to. Surround yourself with positive, uplifting people who are making a positive contribution to life. You only have one precious life and one precious body -- and you deserve to make the most of it. We can't wait to welcome you here in San Clemente as you join the YFS family on an amazing journey of transformation, discovery and joy! 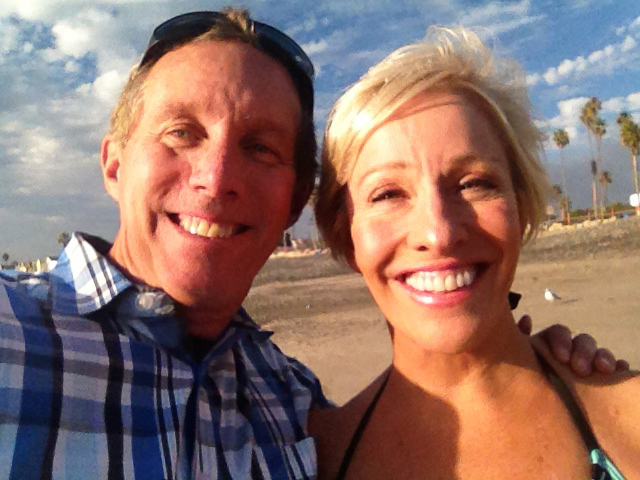 David and Peggy Hall are ready to welcome you to the Yoga for Surfers® Teacher Training this fall in Beautiful San Clemente, California, the heart of surfing in Southern California!